I’m calling for a national guarantee for care workers in Mid Scotland and Fife that will see all workers paid the living wage and an end to exploitative zero hour contracts. With an aging population and patients suffering from complex and multiple conditions, social care will be one of the biggest challenges facing the health service in the years ahead. The easiest thing to do would be to continue a sticker plaster approach to health and social care in Scotland but we must meet this challenge head on. As a result of the Chancellors spending review carried out last month, the Scottish Parliament will receive health consequentials of around £400 million. I joined colleagues in the Scottish Parliament in putting forward proposals for using the majority of extra revenue to invest in social care. As the Conservative continue their plans to introduce cuts to tax credits, official statistics has shown that this will impact up to 43,000 families in Mid Scotland and Fife. Tax credits where introduced by Gordon Brown and the Labour Government to tackle in work poverty. Under the proposed cuts working families could be hit by on average £1,300 a year. Earlier this month Havelock Europa announced a restructuring of its business that will see up to 50 workers lose their job. Following this news I raised the issue in the Scottish Parliament with the Business Minister. During that question I received assurances that those currently going through their apprenticeships would not be affected by the plan to cut the company’s workforce by 10%. This is a move that I welcome. However it has since been announced that the company has reported a pre-tax loss in the first 6 months of this year of £1.8 million, combined with a drop in group revenues of 5.2%. This will bring further worry and insecurity to the workforce, which is why I have written to both Havelock Europa and the Scottish Government to seek reassurances there will be no further job losses. I appreciate that for many business the current climate is challenging and the local Fife economy has been dealt many blows in recent weeks and months from the closure of Tesco in Kirkcaldy, the closure of Tullis Russell and redundancies at Bi Fab. That is why we must work together. I am pleased to announce that I will be taking part in a cross party steering group established by the Scottish Government to work towards the reintroduction of the Post Study Work Visa in Scotland. The group will include members of all the major Scottish parties such as the Minister for Europe and International Development Humza Yousaf, and John Finnie MSP as well as representatives from the business and college and university sector. The post study work visa was first introduced by the then First Minister Jack McConnell and his Labour led executive. Then it was part of the Fresh Talent scheme and its success in Scotland led to it being rolled out across the UK by the then Labour Government. Unfortunately it was then cancelled by the coalition during the last Westminster term. Today I have called for the Scottish Government to clarify what plans it has for a new film and TV studio to ensure that the Scottish film industry is not left behind its UK counterparts. I have made the calls following news that Screen Yorkshire has announced its new plans for film studio outside Leeds. Scotland has the skills, talent and scenery to be at the forefront of the film industry, not just here in Britain but across Europe and the world. However without a dedicated national film and TV studio it faces being left behind. Last week I had the honour of hosting the Big Lottery Fund reception in the Scottish Parliament. The event, which was held in the Scottish Parliament restaurant, was held to celebrate the 20th anniversary of the National Lottery’s first draw and the 10th year of the Big Lottery Fund. I was honoured to host the Big Lottery Fund event and to use the opportunity to highlight the excellent work being done across Fife as a result of their funding. Last week was Living Wage week and Scottish Labour held a debate in Parliament calling for the wage to be the ‘expectation not the exception’. With over 400,000 workers across Scotland earning below the living wage, including 26,000 in Fife, during the debate calls were made for the Scottish Government to extend payment to all public sector contractors. The minimum wage was introduced in 1999 but I believe that now is the time to go further. The figures mentioned above from accounting firm KPMG highlights the need for action. The fight for fair pay is sadly far from over. Earlier this year I supported extending the living wage to staff on public contracts just as I supported colleagues during the debate on the 5th. Unfortunately the Scottish Government failed to support both calls. Ahead of the Housing (Scotland) Bill Stage 3 debate next week I have called for action to reform the rental market in Scotland. Amongst proposals brought forward by Scottish Labour are plans to limit rent increases to once a year along with capping those increases. 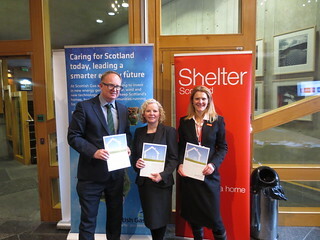 We have also, through my colleague James Kelly MSP, called for an increase in the level of tenancy from 6 months to 3 years. These proposals come on the back of recent figures that highlights that over a fifth of those receiving benefits in Fife find themselves within the private rented sector. The moves that we have brought forward are essential to tackle the housing crisis faced by many across Scotland. With many households facing ever increasing bills we must do all that we can to relieve the pressures families are continuing to face. Affordable rents are one way to achieve this and that is why I support Labour’s proposals for a capping rent increases in the private sector and limiting them to only once a year. I have urged for active promotion of the living wage in Fife after a YouGov poll found that 90% of Scots believe companies should be paying the wage to their workers. Figures estimated that there are over 23,000 workers in Fife who are paid less than the living wage, the 3rd highest total across local authority areas in Scotland. The wage, currently set at £7.65 an hour, would see a rise of £2,600 per year for a full time worker currently earning the minimum wage. I have called for the living wage to be actively promoted amongst the private sector and has urged the Scottish Government to back a tax rebate for firms who pay it, along with establishing a National Living Wage Strategy. Recently I joined with party colleagues in calling for the Scottish Government to use their spending power to deliver the living wage for workers in Fife and across Scotland. The call followed a debate in the Scottish Parliament which will change the way public contracts are handed out to private companies; covering goods and services from the provision of stationary to the delivery of major capital projects, such as the Queensferry Crossing.